If we are to talk about mobile phone’s internet browser, UC Browser will instantly comes to mind. UC Browser is one of the fastest browser I’ve ever used on my mobile phone. 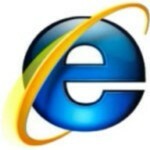 I have always wondered if I can use it on my PC to enjoy the fast pace of internet browsing. 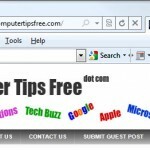 Yes, you can download UC Browser for PC now! It works on Windows 7, Windows 8, Windows 8.1 and the classic Windows XP. Although the ways of downloading UC Browser is different from OS to OS, we will guide you through each one of them. I do not represent UC Browser (by UCWeb Inc.) and this website is not affiliated with UC Browser (UCWeb Inc.) in any way. I’m just sharing its existence because I think it is very much useful to the people. I don’t think I have to explain how amazing UC Browser is. If you’re here it means you were already amazed by it and wanting a download. Well, UC browser is very fast in browsing, has a smart download interface, rich add-ons, cloud syn, incognito browsing and many more. 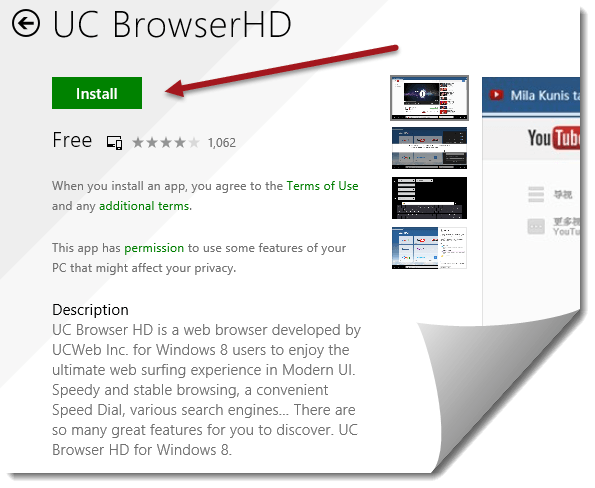 As stated, this method of download UC browser for PC only works in Windows 8 or 8.1 where we get to access the Windows App Store. To download UC Browser for PC, go to the Metro interface (it’s what they call the place where all your apps are) and open up “Store” (it looks like a handbag green in color which has a windows logo on it). Search for “UC Browser” and select “UC BrowserHD” from the results. Click Install. Once the installation is done, you can run UC Browser from the Metro interface and start enjoying the extremely fast browsing environment. Screenshot from Windows Store. UC Browser and UC BrowserHD are trademarks of UCWeb Inc. This method of download UC browser for PC is a little bit tricky. I bet you know about Bluestacks already. If you don’t, you will have to search around for it and install it on your PC before you can download UC Browser for PC in Windows 7 or XP. Bluestacks App Player is a PC program that lets users to run android apps on their PC. So, in order for UC browser to be able to run on Windows 7 or XP, you will have to run through this. To do so, search (Google) and download Bluestacks App Player. Install it and run it. Search for “UC Browser” from the search bar. Click “Install”. Once the installation is done, go to My App in Bluestacks to run OC Browser on your PC and start enjoying the awesome app. Well, if you haven’t already installed UC Browser on your mobile phone, you should really get it now. It’s free on both Android playstore and iOS App Store. UC Browser is best known for its caching feature which saves repeatable components on a webpage onto your phone so that the next time you visit the same website, you won’t have to waste time loading the same thing over and over again, making it to load fast, so fast that it takes just a few seconds to finish loading a page. It also save your mobile internet data if you have a tightly limited data like mine. It also has all the features already mentioned above along with a night mode feature that allows you to read better during the night. To download UC Browser for Android or iOS mobile phone, simply go to the respective app store. Search for UC Browser download, and then install it. Once the installation is done, open the app and start enjoying the fast pace of web surfing!